Oil Sand Box: Seaway Pipeline reversed ahead of schedule - higher prices for Canadian oil to come? Seaway Pipeline reversed ahead of schedule - higher prices for Canadian oil to come? 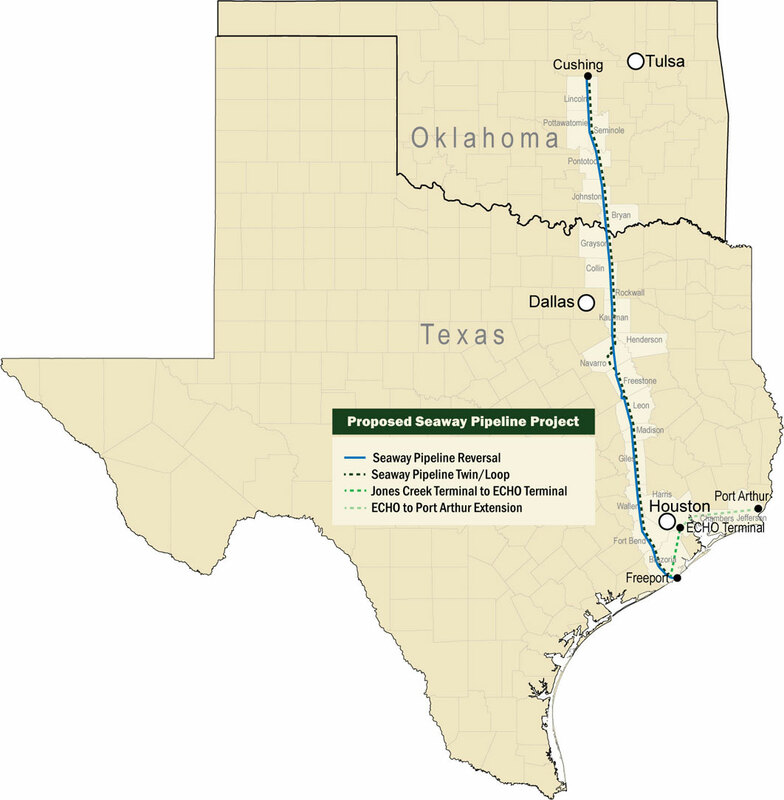 The Seaway Pipeline, which runs between Jones Creek, south of Houston, and Cushing, Oklahoma, a major oil hub, is being reversed, and the first oil to be sent down it is being sold. It will now ship 150,000 barrels per day in the other direction, to be increased to 400,000 barrels per day with improvements. 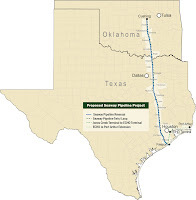 The pipeline is owned by Enbridge and Enterprise Production Partners, who have also recently suggested twinning the pipeline which could bring capacity up to 800,000 barrels per day. A little history on why this is happening, and why it relates to the oil sands follows. After various disturbances in the middle east, most notably increased confrontation with Iran and troubles in Libya, the price of Brent crude has been trading at a considerable premium to West Texas Intermediate. The difference is currently about $15 per barrel and has been as high as $28 per barrel since last year. Historically the differential has been much smaller, roughly $2 per barrel. Part of the reason this differential persisted is that there was not enough export capacity from the refineries on the US gulf coast to Europe and elsewhere. Due to increased domestic production and imports from Canada, imports through the Gulf Coast have become smaller in the US in recent years. The result was this reversal: rather than import oil on Seaway, the US will now export oil through it. Well not entirely export, much of the oil will remain in the US market after refining on the Gulf Coast. Just talk of this reversal has reduced the differential between Brent and WTI. It is quite likely that this and other mechanisms will allow the difference to equilibrate somewhere closer to its historical trend. That should mean higher oil prices for us (North Americans) and lower prices for Europeans. It should have an effect on Canadian oil especially, since there has long been something of a glut of Canadian crude at Cushing that has depressed prices since last year. Bitumen has been selling for about $35 or $40 per barrel less than WTI, and even Western Canadian Select, which is already upgraded, trades at a $7 or so discount to WTI. With increased access to the Gulf Coast refineries and markets, I would expect increased competition between refineries over that bitumen to drive down this differential, and higher prices for already upgraded Canadian oil. Don't worry about higher oil prices North Americans. Despite the depressed oil prices for land locked regions, we are all paying internationally based prices on refined products. So as the differential shrinks, your gas prices are not going to increase. Instead profitability is going to shift from your local refiner to your local or not so local exploration and production company. Good for Canada, not so good for America.